Former APO Hiking Society member Jim Paredes who organized the "Light a Firecracker Against Duterte" movement is now confident that he will win. 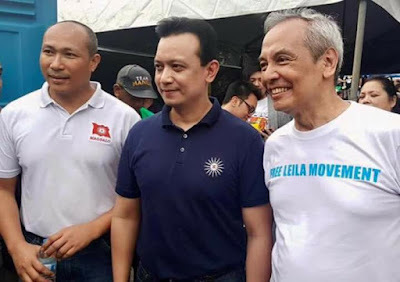 He was last seen with Congressman Gary Alejano and Senator Antonio Trollanes as they prepare to finally overthrow President Duterte with firecrackers. "I am confident that this Light a Firecracker movement will succeed where Light a Fire Movement failed. This will be the end of the tyrannical Duterte Regime. We will restore democracy through this Light a Firecracker Movement. We will not obey the permits and we will not limit to EDSA but we will conquer everything with firecrackers. We already have proof from the International Criminal Court and Agnes Callamard that President Duterte is a killer!" said Paredes as he was interviewed by Pia Ranada-Robles. Members of the upcoming Light a Firecracker Movement have shown up. One could see Kris Aquino, Leah Navarro, Korina Sanchez-Roxas, Agot Isidro and Cynthia Patay ready with boxes of firecrackers. It was confirmed that Alexander Katigbak was last seen in Freedom Park inviting people to join the movement. Cheato Gascon was last seen telling people to join the movement or lose their human rights. An hour later, a special mass was officiated by Socrates Villegas for their success. "We can no longer use peaceful means. We have to use physical force. Duterte hates firecrackers, we'll use it against him! Mark my word! We will set Leila Dilemma free together with other political prisoners. Duterte watch out - your downfall is coming by new year!" said Paredes. It was later revealed that they are now planning a new Yellow Revolutionary Government. This would install Marbobo Roxas as president. However, there is still a dispute on whether or not Leni Loud Robredo should step down in favor of Trollanes.